Every year on Father’s Day, Karen and Wayne Lattuca go fossil hunting with Wayne’s daughter and son-in-law, Adrienne and Kevin Franklin. Most often, they head to Big Brook Preserve in Monmouth County, New Jersey, where Cretaceous fossils such as sharks’ teeth are easy to find. describing an opportunity to go on a members-only fossil hunting expedition in Montana in mid-summer. Instead of panning a stream for plentiful marine fossils, the expedition would involve digging for dinosaur fossils from Suuwassea and Stegosaurus. He immediately contacted his family to reschedule their Father’s Day trip. 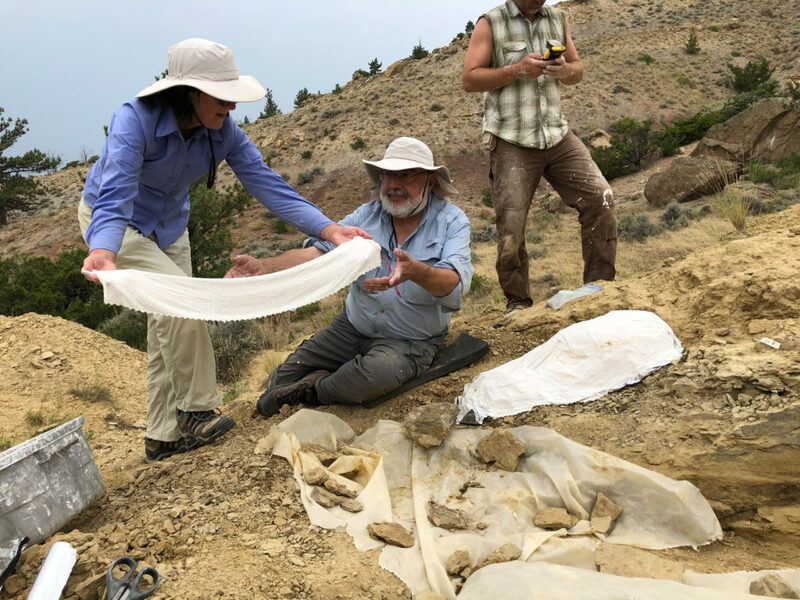 In July, the four trekked into the Morrison Formation of the Big Horn Basin, where the Academy of Natural Sciences and the Bighorn Basin Paleontological Institute have been leading dinosaur digs for years. These expeditions focus on finding, collecting and documenting Jurassic, Cretaceous and Paleogene fossils on the border of Wyoming and Montana, a site where dinosaurs flourished 145 million years ago. The Lattucas were in awe of their freedom to work within the site, where paleontologists have been excavating bones for years. They used screwdrivers, picks, brooms and brushes to clear dirt and stone; applied glue to broken pieces; and even jacketed a fossil. “You get instruction, and then you are trusted — when you find something, they let you continue,” says Wayne. Conditions were rustic and days in the field were eventful. The team encountered biting flies, a scorpion and a rattlesnake. 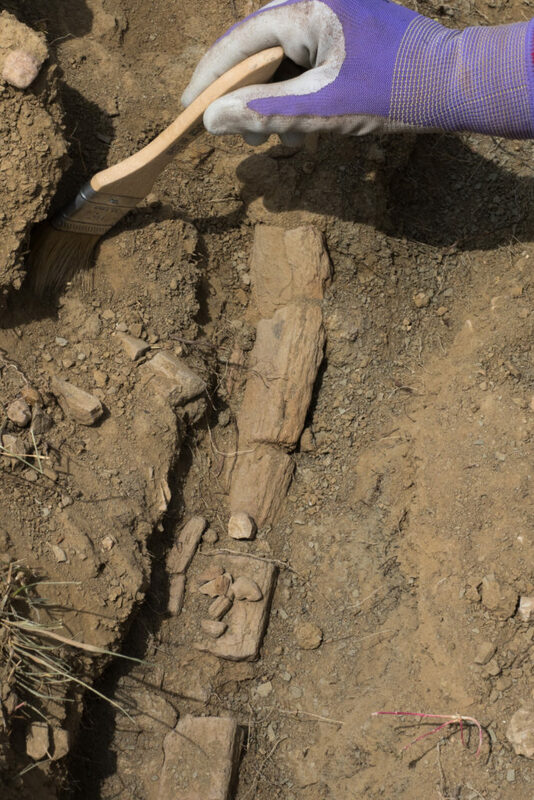 But nothing could take away from the thrill Karen felt when she finally uncovered a dinosaur bone, becoming the very first human to glimpse at the bone, hidden 145 million years in the ground. The Lattucas were keen to participate in an expedition of this caliber, having been fans of Academy science for years. 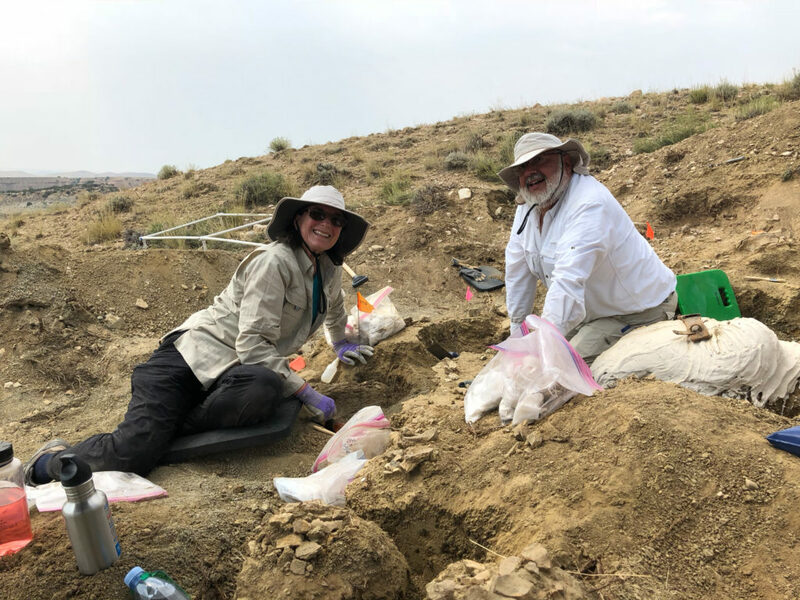 Actually getting to know the staff — those fabled paleontologists with brushes in hand — during the dig helped make the Academy’s field research tangible. 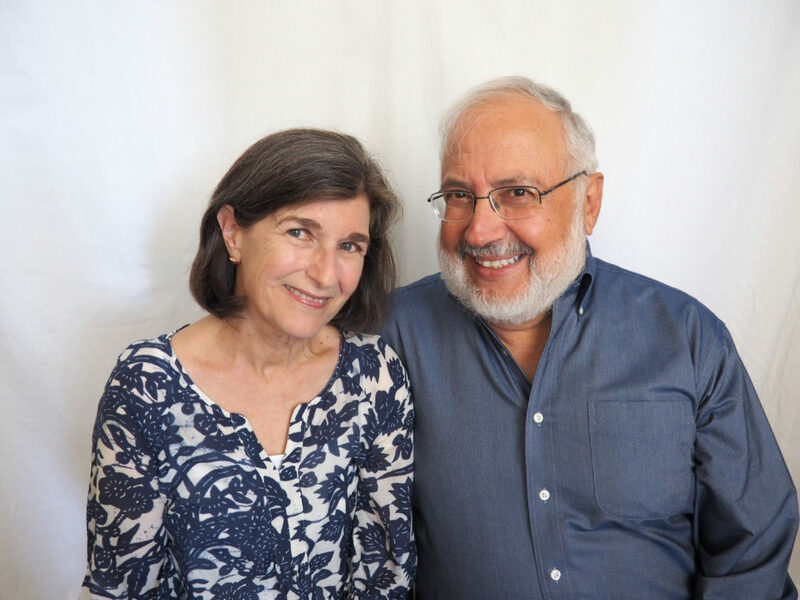 Karen and Wayne have been Academy supporters for several years, and they recently made a gift of appreciated securities, donating an appreciated stock or mutual fund to a charity to receive a tax deduction for the fair market value of their assets. They distributed their gift over several years of membership, upping their membership to the Lewis and Clark Circle so they could take advantage of the benefits that were right for them. They are considering ways to dedicate more resources to our work, including our programs of education and research. Attention Academy Members! Are you resolving to travel more in 2019? Have you ever wondered what it would be like to be a paleontologist? Well, this is your chance! There are still spots available for you to join us in Montana for an exclusive field expedition and unique travel opportunity–exclusive to Academy members. Hunt for fossils, learn about geology and explore the Bighorn Basin in summer 2019. Find out more about the trip, or consider becoming a member so you, too, can take part. Adapted from Academy Frontiers, the Academy’s member magazine, in the fall 2018 issue.